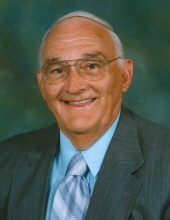 Mr. James Stone, age 78 of North Wilkesboro, passed away Friday, March 29, 2019 at his home. Funeral services will be held 2:00 PM Monday, April 1, 2019 at Oak Grove Baptist Church Hwy 268 East North Wilkesboro, with Rev. Joel Blevins officiating. Burial with Military Honors by Veterans of Foreign Wars Post 1142 and US Air Force Military Funeral Honors will be in Mountlawn Memorial Park. The family will receive friends from 12:30 until 1:45 prior to the service at the church. Mr. Stone was born May 17, 1940 in Wilkes County to Roby Lee and Ruby Blackburn Stone. He was retired from Vanity Fair and was a member of Oak Grove Baptist Church in North Wilkesboro. Mr. Stone is survived by his wife; Ilene Blackburn Stone of the home, a sister; Brenda Mitchell and husband Jim of North Wilkesboro, two brothers; Larry Stone of Statesville and Danny Stone and wife Joyce of Yadkinville and several nieces and nephews. Flowers will be accepted or memorials may be made to Medi Home Health and Hospice 115 Atwood Street Suite C, Sparta NC 28675 or Window World Cares St. Jude Children’s Research Hospital 118 Shaver Street North Wilkesboro, NC 28659. To send flowers or a remembrance gift to the family of James Stone, please visit our Tribute Store. "Email Address" would like to share the life celebration of James Stone. Click on the "link" to go to share a favorite memory or leave a condolence message for the family.